As is common at the end of a trip, there are photos that didn't make the cut for earlier posts but still deserve their moment of light. In this last post for this particular adventure, I share some of these. 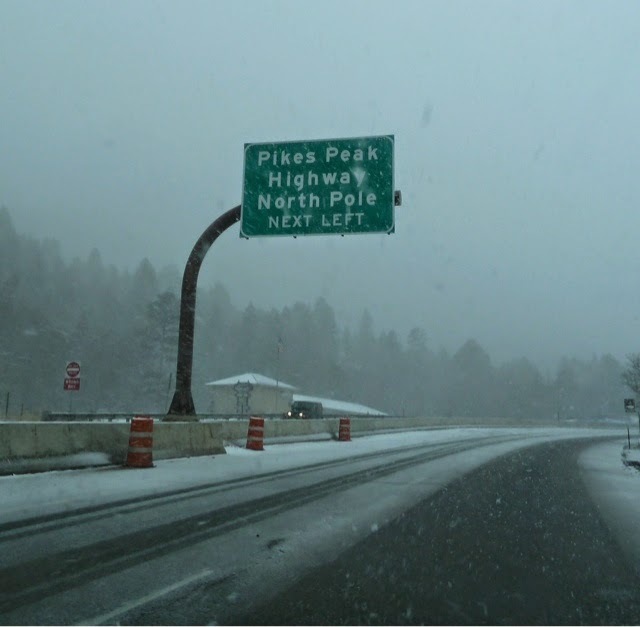 Thought this a great sign, especially in the snow, on the day we drove to higher elevations to find winter, which was available at about 8500 feet. On the way back down the mountain, we decided to stop at the North Pole, which we knew to be a tourist trap, but it was even worse. It was a very sad tourist trap. With only 10 days to go till Christmas, on a Sunday afternoon, this was the scene at the parking lot. The North Pole is open July thru December. In good weather, there are amusements to enjoy. Note the Tilt-a-Whirl on the background. We went to the Denver Art Museum. It is in a very modern building with a very small collection of second tier European artists but the very best collection I've ever seen of Native American arts and crafts. This was a trip of many jogs to the memory. 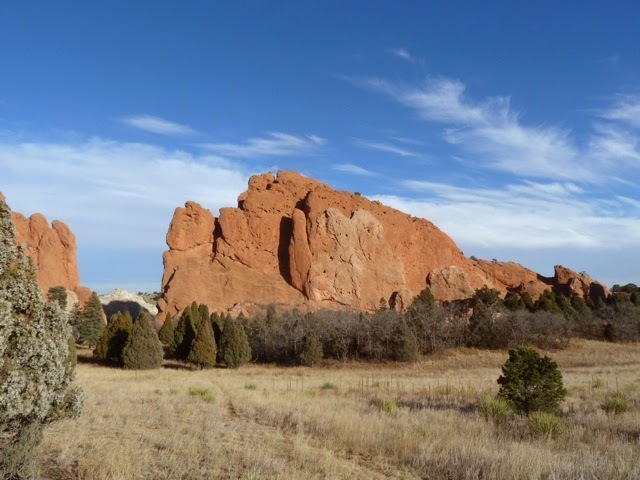 As I mentioned earlier, we were in this town in 1998 with our kids and we recalled the Garden of the Gods, though it seemed smaller now and I can't figure why, and the swankiest restaurant around where we had Alex's 14th birthday dinner. We spent much of that trip trying to find things Miles would eat because he was in a phase where all he wanted was chicken nuggets and pizza. I think that phase lasted about 9 years. 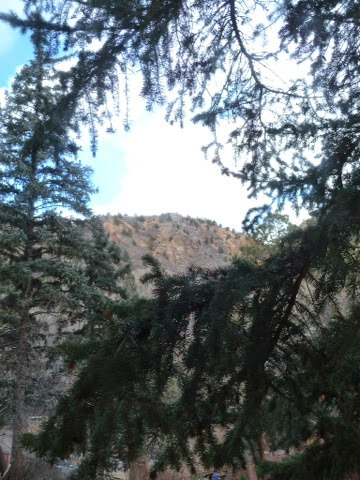 And we recalled driving up and over the mountains when poor Miles got so nauseated - altitude sickness is often worse for the young - and he barfed in the back seat. We pulled over to clean up the mess and Alex distracted him with extensive dialogue from Wayne's World, one of our oft-watched flicks, until we made it down to where his nausea went away. I count that as the moment at when Alex stopped fighting with her brother. 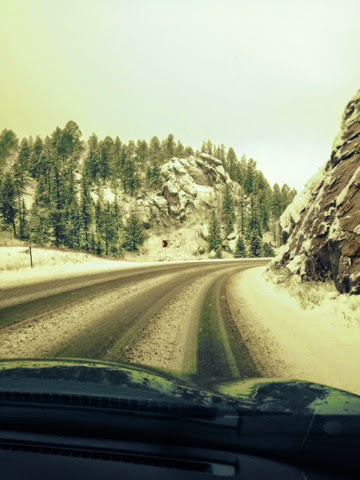 The trip up Pikes's Peak wasn't quite what we had planned. We were thrilled that the weather forecast was accurate and it was a beautiful, clear skies day, since yesterday had been grey and there was snow at the higher elevations. 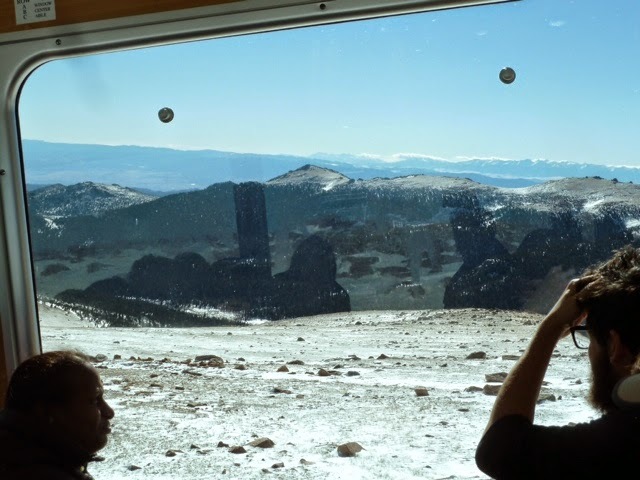 When we arrived to board, we were told that due to a plumbing failure at the cafe at the peak and/or snow drifts across the track, we would be stopping short of the top. Okay. What they didn't tell us was that when we stopped, we would not be allowed to get off the train because there was no there there, so the spectacular views would all have to be experienced through the windows, and since the train doesn't turn around, those of you unlucky enough to be on the left side of the trains well...too bad. You'll just have to crane your neck and lean both directions. Disappointing, but we were offered a refund before departure and we decided to go anyway, so oh well. We did make one stop, in a non-scenic place where the Port-A-Cans were. Sunday morning under grey skies with a hint of snow flurries. Went to a cafe for a bite then headed west to the Florrisant Fossil National Monument, one of the best places for carefully preserved fossils of delicate things, like insects, in the whole world. It was clearly getting colder and snowier as we climbed in elevation, much to our delight. Thought the park had been open for two hours, we were the first at the welcome center and were happily greeted by a very bored ranger who was glad to have people to talk to. We saw fossils, watched the informational video and then headed out to see the enormous petrified stumps and revel in the snow. We also took the opportunity to get our National Parks lifetime passes, now that we are both 62. Lifetime pass for $10! Bless you Teddy Roosevelt and all who have kept the flame burning. I am sure that many of you have been to the Garden of the Gods. We were here in 1998 when we did the classic summer road trip with the kids. What can I say- it was a beautiful day. Couldn't help but wonder, though, if the fundamentalist Christians, like Focus on the Family which is HQed in Colorado Springs, are upset that their city owns a park about gods, plural. I don't know if this has a name, but I'd call it T Rex head. 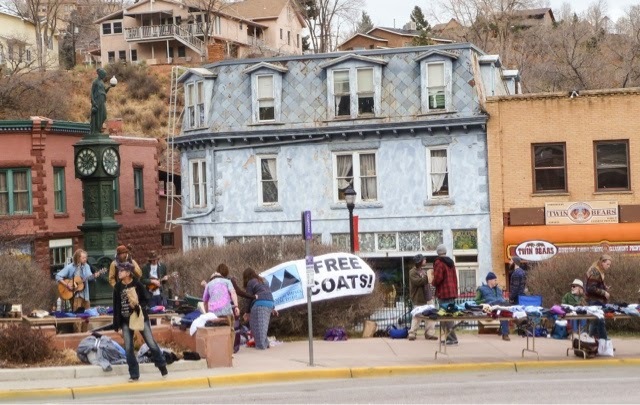 When the law passed, built in was the right for each municipality to decide if it wanted to allow recreational sales along wih medical sales and many towns have said no but Manitou Springs said yes. Twice. In last November's ballot was a provision to repeal rec sales and it was defeated. From July to October of this year, the city reaped about a quarter million in sales tax. For a city with a population of 5200, that's not chump change. 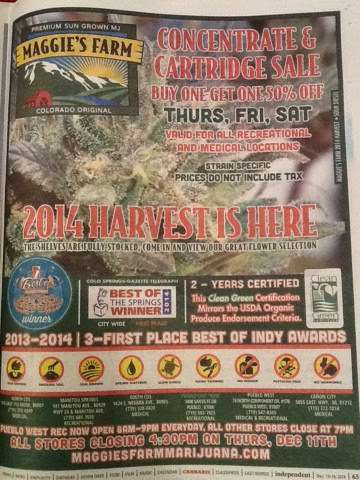 Because the shop itself has a no photos please policy, here is their full page ad in the alt weekly. This is the town square, which is an elongated triangle, where mid-day Saturday finds a free winter clothes giveaway with a three piece, Dead influenced band with assorted hippies, both original and latter day, trance dancing about. We were across the street having lunch in a cafe watching the sun salutations and swirling dreadlocks of the scene. Why do I want to shout at these people to grow up? Why am I so very annoyed by the youngsters, the obviously under 25 year olds trying to party like its 1969? Daft Punk, not Grateful Dead. Why do you want to emulate your grandparents, I ask in my head. Indeed, what is so funny 'bout peace, love and understanding? Mark asked if I had anticipated longevity for any part of 60s pop culture. In 1964 did I say to myself that the Beatles would still be commonly heard in 50 years? No way. Did I expect, in 1967, that tie dye T shirts to be common in the 21st century? Hell, no! Did I think I would live to see legal weed? Actually, I did. 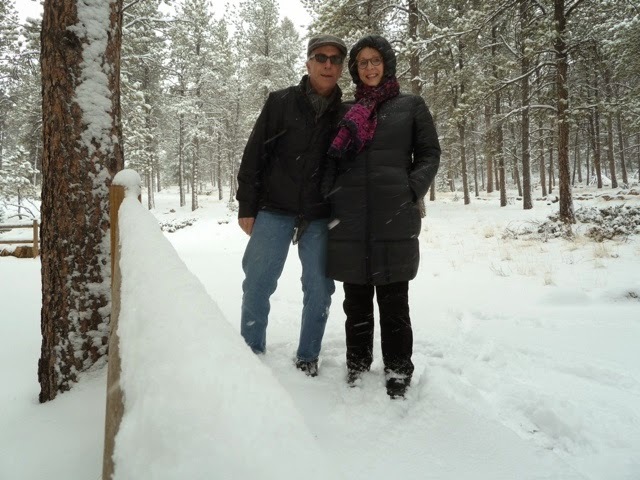 Remembering the fun of being in Northern Europe last year in December and being both Michiganders with a nostalgic and romantic attachment to snow, I decided we would have a little vacay in a winter climate but NOT a ski town because we don't ski and they can be very expensive. Flights to Denver were cheap and easy in mid-December so we ended up in a town we had visited with our kids back in 1998. Manitou Springs, Colorado. It's the mountains! Surely there will be some snow, right? When we got off the plane it was 63 degrees. Oh well, we knew it was far from a sure thing. Mark took the photo below from our stoop and I think that is Pike's Peak. Maybe not.